ClientAuthenticator � This thread would be a deamon thread. It will authenticate client passwords and usernames. Once clients have been authenticate, their information will be stored in the Data Structures. That data is shared by various components in the engine. The information passed should include the username, login time and a reference to the client socket (that reference will be used by the Listener). Database � This can be a relational database or it can just be a file such as the linux /etc/passwd file. But the /etc/passwd file itself cannot be used because it can be very unsafe due to the fact that some hacker might be able to listen in the connection and get the password. That means that the hacker will obtain the linux password because it is the same as the Server password. Data Structures- Structures such as Lists, trees, or HashTables can be used. These classes may contain search and sorting algorithms. The information in these Structures should include the username, login time and a reference to the clients� sockets. It may also include the files checked out or locked by a particular client, etc. Listener- This is a thread (or threads) that is constantly checking sockets queues for requests issued by clients. If a request is made, the Listener wakes up one of the sleeping threads in the thread pool to handle the request. Thread Pool � Keeps threads sleeping if a client is not using them. This is good for performace. 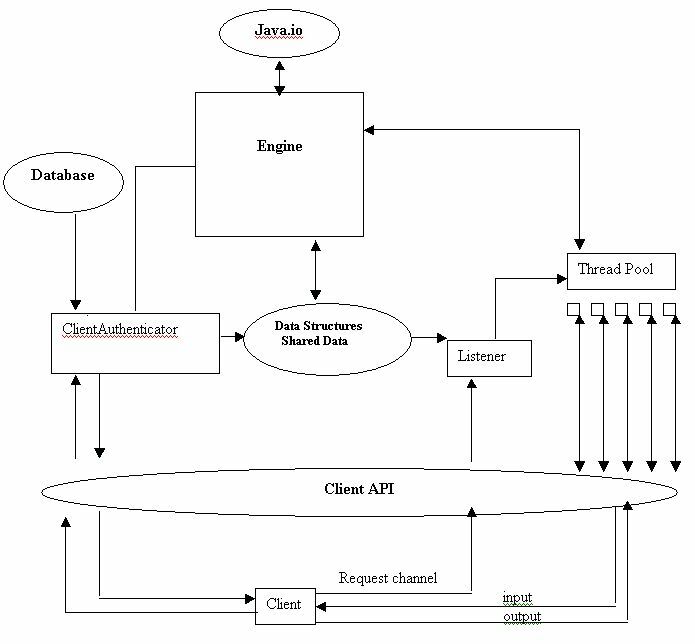 Client API � This api is the protocol (rules determining the format and transmission of data) for communicating to the Server. Each client that anyone creates should use this protocol. Any connection to the server attempted without using the Client api will be denied by the client authenticator. To accomplish this, we may use encryption and/or agreement protocols. Engine- The engine will contain the main functionalities. It will be able to compare files for clients, merge files, lock files, retrieve and update files from disk, create new files, delete files, etc. The result of the operations of the engine will be passed to the particular thread of the thread pool that asked for it.